The Delta type EV electrical solenoid valve is a normally closed one-way direct acting valve. 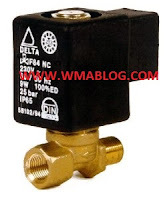 It is designed for use as an interrupter valve or as a shut-off valve. The body is made of brass, the core is of solenoid quality steel and the seal is a synthetic rubber which is suitable for use with light distillate oils and other fluids that are compatible with the above materials. All valves are 100% tested and are fully warranted.